Hypocenter depth recalculated from 82.0 to 80.0 km. Puerto misahualli / MMI IV (Light shaking): Awoke with bed shaking for approx 30 seconds followed by another shaking lasting another 30 seconds.windows rattling. 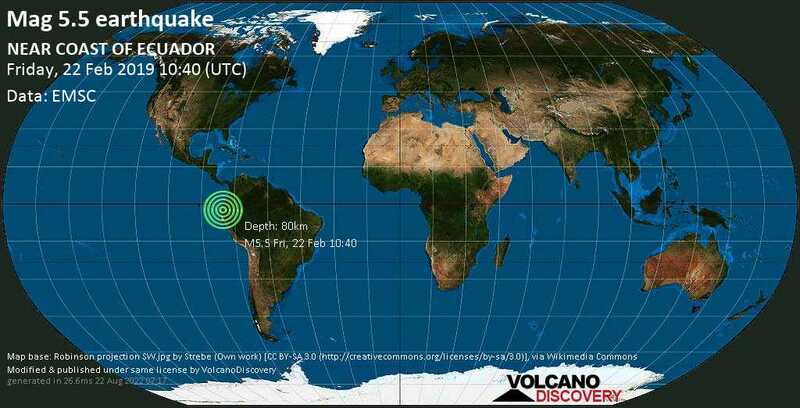 Cuenca, Ecuador / MMI IV (Light shaking): Re-woke us shortly after quake of 7.5. Very light shake. Cuenca / MMI IV (Light shaking): We felt 2 quakes while we were sleeping. Pucallpa, PERU (890.6 km SE from epicenter) [Map] / MMI IV (Light shaking): Woke me up-I looked at the clock (5:40 local time). It shook for almost a minute. Baños / MMI III (Weak shaking): Lighter then the other 2 20 minutes earlier, stil felt the room shocking. Guayaquil / MMI VI (Strong shaking): People left the houses and waited on the streets a few minutes. On my house is a little damage on the brickwall. Guayaquil / MMI V (Moderate shaking): Were already awake and up after earlier quakes. Got us back out of the house but not as long and strong as the more distant quakes. Mindo / MMI IV (Light shaking): Bed was shaking noticeably! MIRAFLORES GUAYAQUIL (24.3 km WSW from epicenter) [Map] / MMI VI (Strong shaking): A strong sudden shake came to knock my clock to the floor, freezing its time at 5:37 A.M. when the battery was dislodged. The abrupt force didn't last long as its end turned into gentle waves. Still alarmed by the 1st Earthquake moments earlier, I thought it was an aftershock. Totorococha, Cuenca, Ecuador / MMI IV (Light shaking): This is the 4th Earthquake I experienced so far in the past hour. (one is not even listed yet!) This was not as strongly felt as the last 2 in the 7.5 to 7.7 range... Shook my building pretty good, cracks in the walls a little but we are all ok here. Just "shook up". Quito / MMI III (Weak shaking): The shaking was a bit weaker than the earlier 7.5, and much shorter. Mindo / MMI VI (Strong shaking): After the first quake which woke us up in our rooftop tent due to the shaking of the whole car, this was a second one slightly shorter but equally intense. Puerto Cayo, Ecuador / MMI III (Weak shaking): Felt it in bed about 20 minutes after the other one. Thought it was an aftershock. It felt the same intensity as the last one.